France: A tsunami of angry bikers cause chaos again! For the third time this year, France has been the scene of enormous demonstrations this weekend, where thousands upon thousands of angry bikers took over every town and city nationwide, a real slap in the face of the French interior minister, Claude Guéant. Facing a deaf government despite previous demonstrations on 18 June 2011 gathering almost 100,000 protestors all over the country, French bikers continue to express their radical opposition to a series of government proposals, designed by Claude Guéant, to treat motorcyclists like cash cows rather than recognise that motorcycles are the golden solution to environmental and congestion issues and also offer a cheaper, faster and more reliable mode of transport, especially for those in a weaker financial situation. The angry bikers demand from Claude Guéant, their interior minister, the immediate implementation of measures designed to promote motorcycle training and awareness rather than solely focus on cashing in thousands of euros a day from bikers who may fail to adhere to anti-bike rules and regulations imposed on them without valid justification. Among others, the bikers have been protesting at the proposed compulsory wear of a fluorescent high visibility vest, which Guéant insists on being a measure designed to reduce the number of motorcycle accidents. The bikers have also been protesting at the continued ban on filtering through stationary or slow moving traffic, whilst their government stupidly expects motorcyclists to remain stationary in traffic jams, as if they were driving cars, lorries and coaches. The bikers are also angry at the proposed introduction of larger size registration plates in an unfounded attempt by the government to reduce the number of motorcycle accidents. The bikers have just had enough with the French government’s false excuses to push through money-grabbing measures rather than effective ones designed to improve the safety, awareness and training of all motorcyclists. The Fédération Française des Motards en Colère (FFMC – French Federation of Angry Bikers), through its highly effective network of branches all over the country, called all motorcyclists based in France and beyond to go down the streets and protest en masse on 10th and 11th September 2011, against the French government’s continued attitude to treat bikers like cash cows. As a couple of protestors said in the town of Limoges, where more than a thousand bikers took over the high street, “We will not tolerate to be treated like cash cows and adhere to legislation that is purely there to grab money from us. We will fight, continue to demonstrate and cause massive chaos all over the country until these short-minded and money-grabbing guys abandon their policies and listen to what we’ve got to say to them. If this is the only way we have to put our points across, then so be it”. France was again brought to a complete standstill this weekend with 50,000 bikers blocking every town and city throughout the nation. Even the smaller size towns saw protestors invading their streets, such as 800 bikers in Niort, 1,000 bikers in Epinal (eastern France), 100 motorcyclists in the small town of Rodez, 600 in Angoulême, 500 in Bourges, 300 in Colmar. The bigger towns and cities were the scene of much larger demonstrations, including Lyon (France’s second largest city) where 3,000 angry bikers were counted, Toulouse 2,000, Strasbourg 1,500, Montpellier 2,800, to name a few. 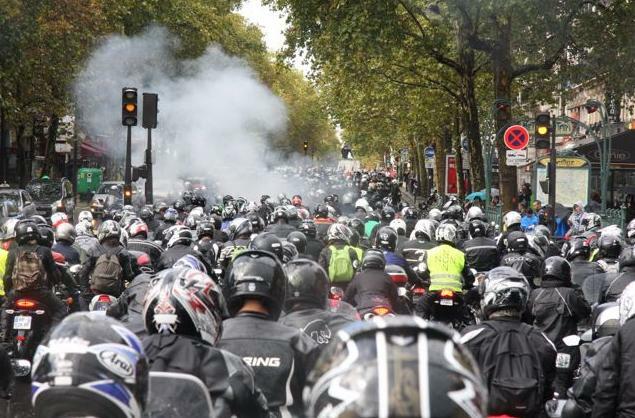 Paris saw the second largest demonstration after Lille with over 4,000 bikers riding through the capital and bringing the heart of the city to a complete blockade for hours. 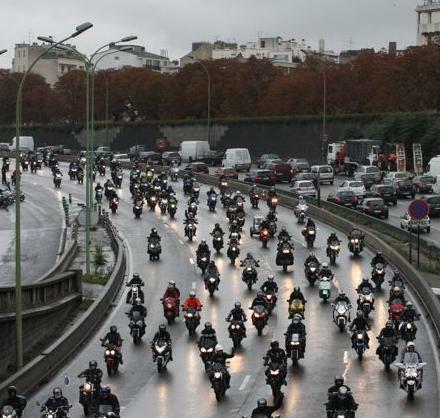 Thousands of bikers took over the Paris peripherique (ring road) and caused enormous traffic jams! Treat bikes like cars and they'll behave like cars! 4,000 bikers riding through Paris and blocking the whole city centre! 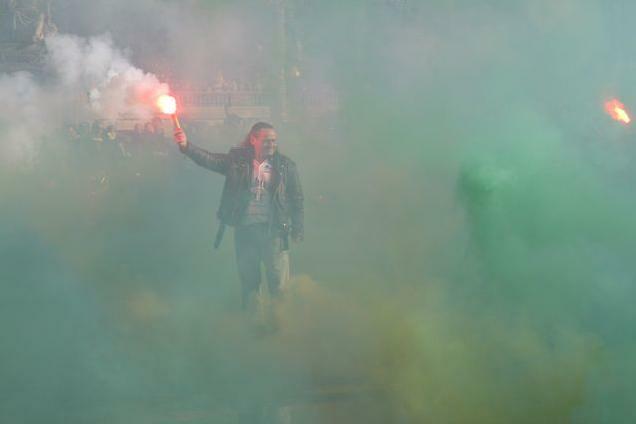 Paris covered in smoke with thousands of bikers reviving their engines to show the government that they will stand up! 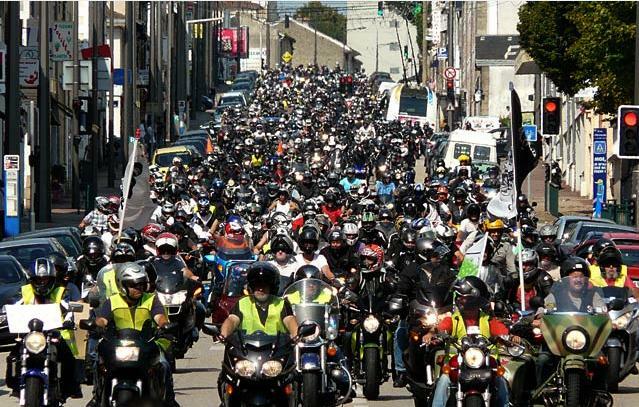 Bikers from neighbouring countries joined the demonstrations and showed support to their French cousins, including a number of bikers from the United Kingdom who crossed the Channel to join the largest demonstrations of the weekend in Calais, Lille and Dunkerque, attended by over 5,500 bikers. Before riding through the centre of Lille (France’s fourth largest city) and bringing it to a complete standstill, the angry bikers took over the A1 motorway and totally blocked it for a good hour. A large group of bikers also joined the Lille demonstration from Belgium, thus helping their British counterparts to mark the strong solidarity between bikers across the European Union. We wonder how far the bikers’ actions will go until the French government capitulates, especially at a time when politicians are campaigning for the elections next May. Based on past experience, it is highly unlikely that the bikers will give up their fight, the government will eventually give up their money-grabbing policies if they don’t want to see the country brought to a complete standstill again and again. What a pity that Bikers in the UK have to go abroad to demonstrate anregister their displeasure at the nonsense being enforced on a group of legitimate road user. WELL DONE FRANCE !!! Join the protests on the 25th September all over England and ireland. Organised by M.A.G. we will be forming rolling roadblocks almost ALL the way up the M1 and all over many other main roads. This is only stage 1 of the plan. Further protests will happen if the government don’t start listening to us. I am not in anyway speaking for M.A.G. Well done bikers, notice though that the mainstream UK press don’t report these demonstrations. Are they scared that other motorists not just bikers may well start to protest? « Paris: car pound or bike pound?